Those who know Khun Mae would know that we are often encouraged to do good and to transfer merits (回向功德) to our parents, guardian beings, kammic debtors and others who are in need. To recall all the past and present good deeds being done and to transfer to the person. It’s a bit hard to put it into words and I know that some may not quite understand it. Transferance of merits works – it helps to smoothen our path in life, to rid of obstacle or reduce the level of severity of one’s bad kamma. Through applying this simple teaching of Khun Mae, I’ve experienced its profound effects. So I thought I would put in a story by sharing with you my own recent experience. Hopefully the reader would have a better idea of how transferance of merits works. This happened end of last year, just the day before I was due to return back from Thailand. I receive a distress message from a close family friend. Her brother in New Zeland was diagnosed with cancer and from the ultrasound done, there are shadows seen in the area of the liver, stomach and intensines- in which the doctors suspect that the cancer could have spread. The man and his sister did not know where else to turn, so they requested me to please pray for him. The short term ordination was over and I got the message in the evening. I was due to be back on the next day’s early morning flight. 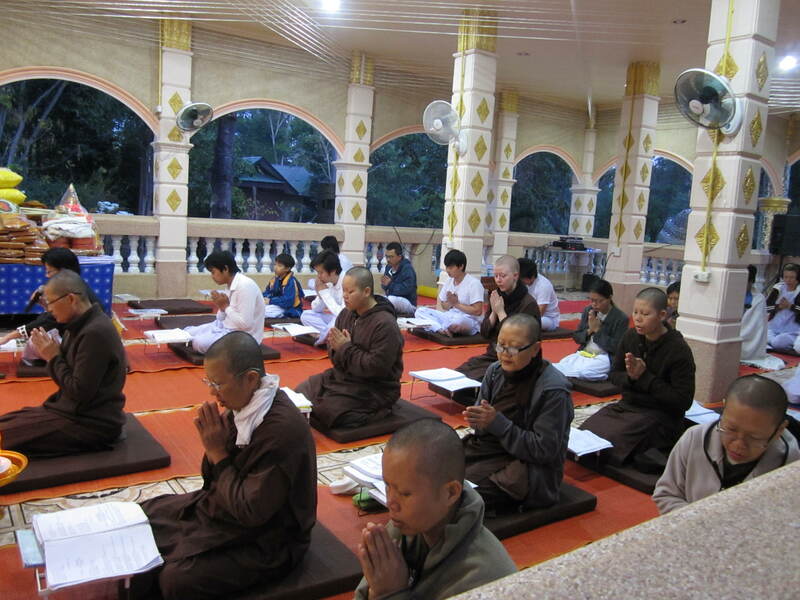 If I had known it earlier, I would have transferred my merits during the chanting and meditation session. Feeling that there was nothing much I could do, I consulted Khun Mae. Khun Mae advised me that I could always help him by chanting and meditating on my own and transferring the merits to him. In fact, I’ve heard her telling the same advise to some of her followers who had encountered some difficult situations- she said that they’ve observed the 8 precepts or have ordained- to consistently practice chanting and meditation and to recall these past deeds and transferring to the other person to help him/her. I took on her advice. Before beginning the chanting I did a short meditation and indicated that I would like the merits to be transferred to the person (with his name) in New Zealand. Then I chanted some chants from the chanting book and at the end during the transferance of mertis, I recall the time when I had been on the 8 precept, helping out Khun Mae in the temple, etc and sincerely wish to share the merits with this person. Even though I seldom see this uncle, but he was the brother of a close family friend- and I’ve known some of his good points. This man was given away from a young age to this family and they all grew up very poor. Eventually he was able to make it to New Zealand and settled there as a resident. But he is an extremely filial son who never forgotten who had raised him up- each time he comes back from New Zealand, he would make a trip to visit his adopted mother’s grave. And before he went back, he would go again to visit there. He also had gratitude for people who had helped him and always try to repay people’s kindness. Recalling his positive attributes, I made the aspiration that may the merits, as well as his kind attributes would be able to get him through this ordeal. If there are any kammic debtors- may they accept the merits and prayers and was able to forgive him. I did this about few nights but soon, the demands and stress of my job tired me out by the end of the day and I did not have time to do the long chanting anymore. Sometimes I still transfer merits when I remember about him. That was about December and the family friend had flown during December to take care of her brother. Then, just few days ago, I received a long distance call from New Zeland- both the sister and brother spoken to me to thank me for my prayers. He had, almost miraculously recovered. Honestly, I did not think I have done anything much to deserve that gratitude. However, the brother described an unusual sequence of events that saw him from being a sick person and leading him towards the route of recovery. Firstly, he had been having irritable bowel syndrome (IBS) for years- I remember hearing him complain about his IBS at least 5 years ago. Check-ups had revealed nothing unusual. However, in December 2011, he was diagnosed with cancer and appearently the cancer had spread to various parts of his body. It was when his sister flew to New Zealand to take care of him. As the doctors were about to decide on the course of treatment, they had decide to conduct further tests and from there, found out that instead of cancer at his lungs and stomach region, he actually had a condition called thymoma. The operation was scheduled to remove the tumor growth. At the same time, a specialist was able to identify that aside from having thymoma, he also have Addison disease (it is similar with diabetes- however in diabetes, the patient has insufficient insulin hormone. In Addison, the patient has insufficient cortisol hormone). The discovery that he had Addison disease is vital because had the doctors not know it before the operation, the man would have died on the operation table due to complications. For Addison disease, the anesthetist ensure the cortisol hormon was added. The man recovered fairly quicky from the operation. His tumors were sent for tests and the results came back that these tumors were cancer free. He was told by his doctor that if he continues to take medication (it is lifelong), and practice a healthy lifestyle, he can look forward to many years of health. When I relayed the incident to Khun Mae over the phone, she said that chanting is important as part of our practice. Chanting with a sincere heart to help others without expecting anything in return is effective. And the chants of Dhamma can be heard all the way up the heavens with the devas rejoicing with us. She also took the opportunity to remind me not to slack in my practice- to read the chants and their translations, just spare short time everyday to do it. The benefits are enormous.